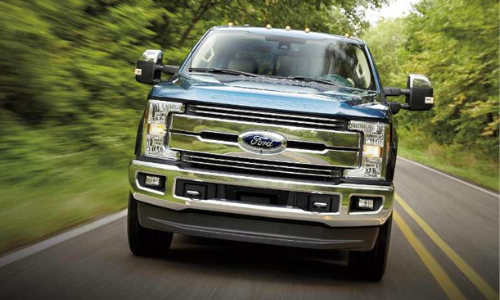 Depending on what you need to get done, choose from the F-250, F-350, or F-450. At every size, you get class-leading power and the benefit of Canada’s number one truck lineup. Whether you choose the advanced 6.2L V8 gasoline engine the 6.7L Power Stroke Diesel, you get the perfect combination of power and efficiency. 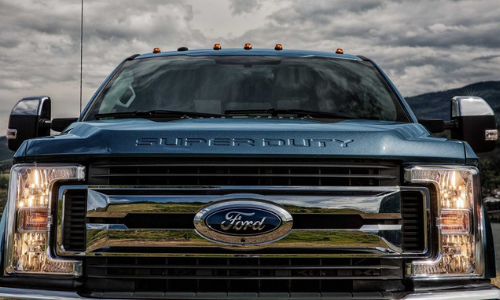 The Super Duty is just that: Super. It out-hauls and out-tows the competition, and doesn’t even break a sweat. 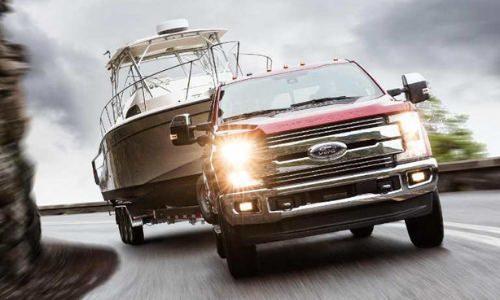 With a maximum conventional towing capacity of 21,000 lbs, the 2019 Super Duty is greater than ever before and is way ahead of the other heavy-duty pickups in its class. 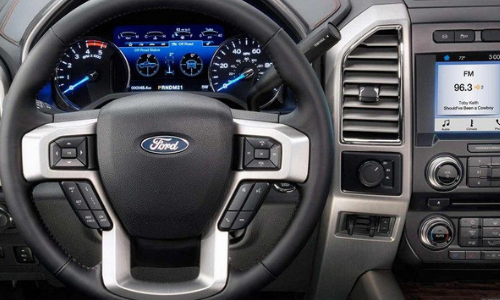 The best-in-class Power Stroke Turbo Diesel V8 powers through with 450 hp and 935 lb.-ft. of torque. 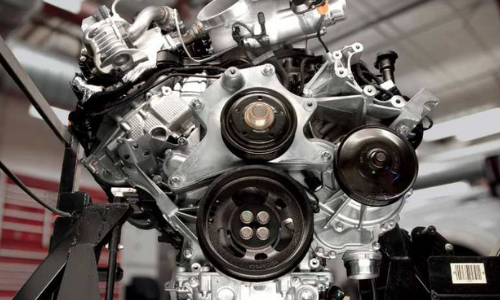 Compacted graphite iron, instead of cast iron, makes the engine block stronger and lighter than ever. Activate the Smart Exhaust Brake function to restrict the turbocharger’s exhaust flow for greater control travelling downhill and save brake life. The new Super Duty can hold more fuel than ever so you can get more done without having to fill up. Then factor in its fuel efficiency in both the 6.2L gas V8 and 6.7L diesel engines and you will be glad you chose the best heavy-duty pickup truck. It doesn’t just look tough; it is tough. 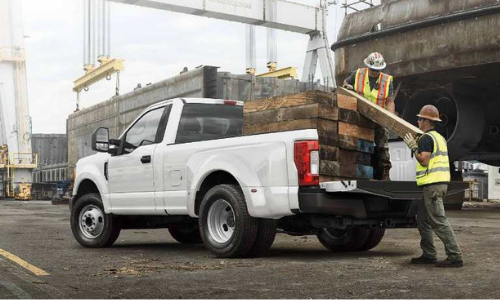 The Super Duty prevails as the stronger and better-looking truck on the job site. We may be a little biased about that. 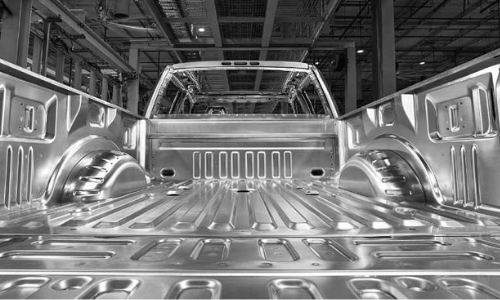 Military-grade aluminum alloy slashes body weight to reinvest in the axles, steering, chassis, and frame. The result? A pickup truck that’s stronger and lighter than its competitors. What’s more, you can say goodbye to dents with a stronger resistance to dings and red rust corrosion. 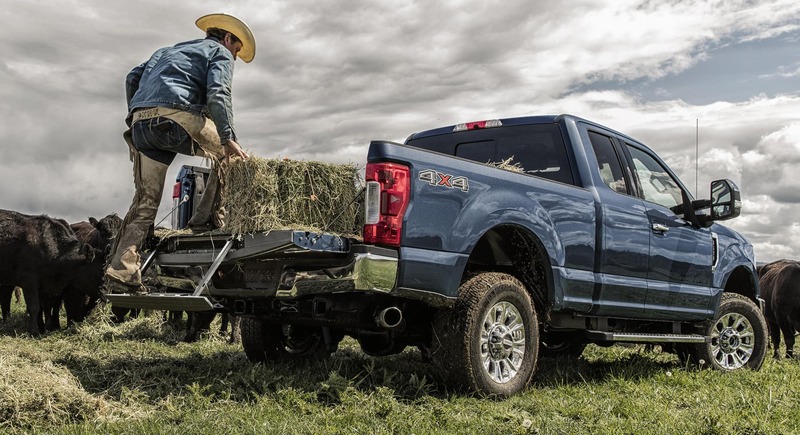 Work is easy with the Ford Super Duty. With the class-exclusive BoxLink system, tying down cargo is a breeze with reinforced box sides. The four plates can be configured to accommodate accessories like storage bins and loading ramps. And when the sun starts to set, LED box lights keep the light when you need it. With more configurations than any other line of heavy-duty trucks, your truck will truly be your truck. The Super Duty’s two-bar style grille, chrome options, and straight lines offer a rugged appearance that stands out from the crowd. When you are at work with your Super Duty, making your job easier is the goal. When you’re hauling, having an extra set of eyes is helpful. What about having 7 extra eyes? 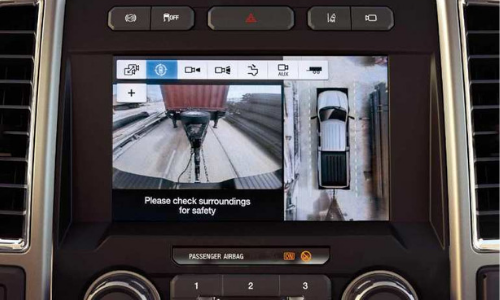 The Super Duty has up to seven available cameras to enhance visibility and safety; including the tailgate HD 180/360-degree camera displaying all sides of the truck, and class-exclusive Trailer Reverse Guidance so see where your trailer is going. Convenience is not overlooked in this heavy duty truck. Store cargo safely inside the cabin with rear seat storage and flat load floor. Rear-hinged doors open 170 degrees for easy loading and unloading of large cargo. 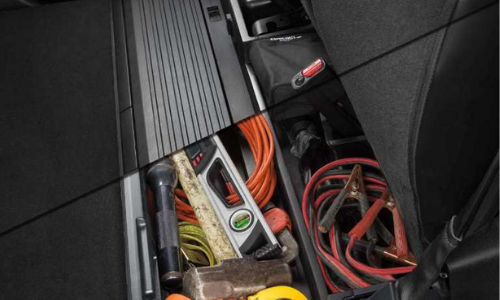 For storing loose items or valuables you want to keep hidden and secure, the crew cab offers a folding lockable under-seat box. The Super Duty is more innovative than ever. Ford Pass, Smartphone connectivity, and 110V outlets keep you connected when you need it most. The available programmable upfitter interface allows you to connect aftermarket accessories, like a winch or 2-way radio, without the need to cut into the truck’s electrical system.